Born out of Moscow’s nobility in 1799, Alexander Pushkin has long been thought of as the founding father of Russian literature and one the greatest poets of all time. For a man who barely lived 38 years before his untimely death, following an ill judged duel in 1937, it is a testament to his poetic vitality that he is still much remembered, revered, and loved today. Pushkin was only 15 when he published his first poetic work, whilst at the Imperial Lyceum, and he quickly became recognized across the Russian arts scene as a new and important voice. After finishing school he dabbled for a while in the gaudy and lively world of the city’s intellectual youth before publishing his first long work, Ruslan and Lyudmila in 1820. This epic fairy tale had taken 3 years to write and caused a certain amount of controversy partly because of the content but also its style. Over the years since his death, the West has generally put Pushkin to one side but, it’s true to say that the Russians view him much the same way as the British do Shakespeare. Another hurdle that needed to be traversed over the years since his death was that most of his work was produced in verse – difficult to translate effectively into other European languages and remain truly reflective of the original Russian meaning. His life was almost as colorful as his prose. It’s widely thought that his great grandfather was an African prince who was later absorbed into the Russian nobility. 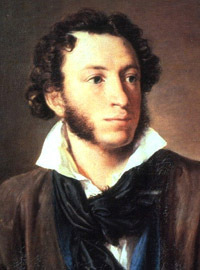 Even from a young age, Pushkin was dedicated to the idea of social reform that led to him being placed in exile and a censorship placed on his work. At the age of 32 he married 17 year old Natalia and, by all accounts, there were bad omens aplenty during the day of their wedding. Despite the turmoil of his life, it is accepted by many that some of Pushkin’s works are masterpieces. He also influenced the style of literary language for many years following his death, and from his works were born such Russian literary legends as Tolstoy and Gorky. The Bronze Horseman is widely thought to be one of his greatest poem, and is based on the statue of Peter the Great in the Russian city of St Petersburg. Because his work was censored by the Russian court, it was only the prologue that was allowed to be seen during Pushkin’s lifetime. The Bronze Horseman in St Petersburg has become an iconic image over the years and has been used for metaphor by the likes of Dostoyevsky and Andrei Bely. By 1831, Pushkin was becoming a major influence in Russian literature and was accepted back into the Russian court but with a lowly title that at the time infuriated him. Often epic in scale and rife with Russian national verve, it is no wonder that Alexander Pushkin is viewed with such reverence in the country of his birth. Despite his success, Pushkin had a destructive streak and fell into a spiral of debt. Hearing rumors that his wife was having an affair, the poet challenged her supposed lover to a duel. Pushkin was injured and, at the age of 38, died from his wounds a couple of days later.